Climate change remains one of the major challenges we face today. Although the magnitude of its effects is unknown, it’s clear that every part of the world will be affected in one way or another, and that the damages outweigh any potential benefit without a doubt. The general public interest in global warming issues has left the lawmakers with no option but to lead in the negotiation of gas emission reduction. This is because these gas emissions highly contribute to the depletion of the ozone layer. They also cause global climate changes and other cases, acid rain and other detrimental environmental problems. To curb on the carbon emissions, emission trading scheme and carbon tax are some of the tools used by the regulators, in a bid to lower emissions. The carbon tax is forms of pollution tax that transfers a fee on the use, production or distribution of environmental pollutants, and is based on many pollutant are emitted. In a bid to control the level of emission, the government comes up with a certain price based on the amount of carbon, which is then translated into a tax on oil, natural gas or electricity. Because this tax is expensive, business persons, individuals, and utilities are encouraged to cut down on the usage or seek alternative energy sources. Provides a clear market incentive to reduce emissions while also allowing the market to decide when and where the emissions should be reduced. Easy to establish and administer. This makes it easy to be incorporated into existing tax systems. It provides a significant source of revenue for governments. Provides a known carbon price hence provide considerable price certainty. This assists in investment trading. It does not guarantee a specific emission reduction outcome, as opposed to the emissions trading scheme. A high carbon tax is required to deliver significant emission reduction whereby high taxes face a lot of political resistance. Some polluters may be willing to pay the tax as opposed to reducing the emission. 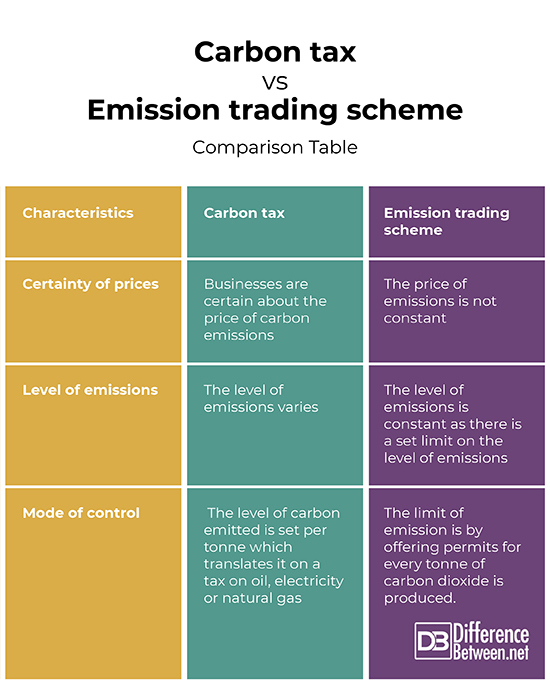 What is Emissions Trading Scheme? An ETS is a framework that works by setting a limit on emissions. It also requires emitters to obtain a permit for a level of emissions. The level of the limit here is a determining factor to the number of permits available. In this case, if emitters do not have a permit, it is required of them to cut back on the level of emissions. They could alternatively purchase a permit from someone, who must then stop the emissions. The cost of emissions in ETS equals the price of selling or buying a permit. It should, however, be noted that the level of emissions is determined by the cap, hence the price is caused by the cuts on emissions. The price does not cause the overall limits in emissions. 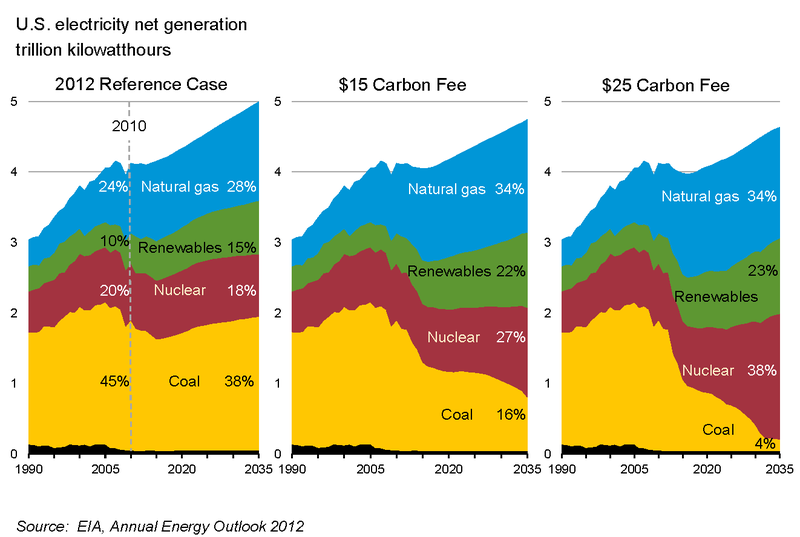 In both, the markets play a big role in determining how much the quantity of emission is reduced for the carbon tax. 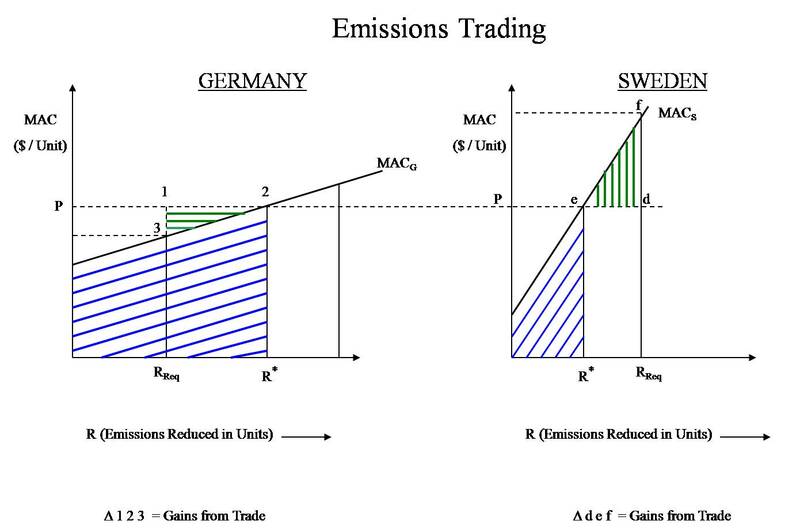 The market also determines the price of carbon in ETS. In carbon tax, businesses have certainty about the price of carbon emissions while in the emission trading scheme, the price of emissions is not constant, and can be volatile. The level of emissions varies in the carbon tax. This is however not the case in emissions trading scheme as there is a set limit on the final level of emissions. In carbon tax, the government sets a price per tonne of carbon emitted and then translates it into a tax on oil, natural gas or electricity. In ETS however, the limit of emission is set by offering permits for every tonne of carbon dioxide produced, hence they can emit a set amount which is accorded to the level of emissions that they produce. In a bid to curb emissions, business persons, individuals and entities should support carbon tax and emissions trading scheme, in a bid to conserve the environment. They can do so by adhering to the set rules, based on the amount of emission that is allowed in the region of operation. Tabitha Njogu. "Difference Between Carbon Tax and Emissions Trading Scheme." DifferenceBetween.net. November 22, 2018 < http://www.differencebetween.net/science/difference-between-carbon-tax-and-emissions-trading-scheme/ >.